Grant Me Hope: Shenella dreams of giving children "a life I didn't have." Sixteen-year-old Shenella is a funny, quick-witted kid who likes to joke around, but the foster child gets very thoughtful when talking about her hope of being adopted one day. So, naturally, she would like to become a foster parent when she gets older. “I can care for children of all ages,” she explained. You might say she’s wise beyond her years. “I’ve come a long way,” said Shenella who takes pride in getting to the stage in her life where she is now. Professionally, she’d like to become a nurse when she grows up. “I like helping people out, and I’m not afraid of blood and all that stuff,” she smiled. Harry Potter is her favorite book series. Reading is one of the activities she likes to do for fun along with dancing, cheering, basketball, and volleyball. And if you get her in the kitchen, she’s a happy camper. “I like to cook. When I first learned how to cook, my favorite was enchiladas,” she said. She really enjoys mac ‘n’ cheese and chicken sandwiches, too. She’s also a dog lover. “[Dobermans] are kind and sweet,” said Shenella. But she really looks forward to spending time together with people -- specifically, her future adoptive family. “I just want a family to cook dinners with, have fun, and enjoy each other,” she explained. 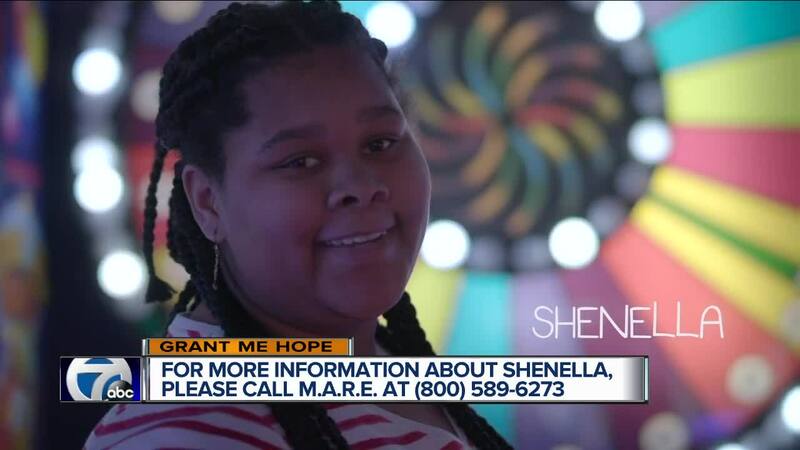 If you’d like to find out more about adopting or fostering Shenella, please call the Michigan Adoption Resource Exchange at (800)589-6273. You can also find out more about her by clicking on her bio here. Please share this Grant Me Hope video on social media if you’d like to help her get the word out about her adoption dream. Thank you!